Hundreds of miles away someone else was preparing to make a slightly different journey: Merdock and his apprentice Madelia were in the highest tower of the Black castle. Sunlight barely squeezing through the minute slits in the warped window shutters. The twisted warlock was standing looking down upon a large bowl of jet black swirling liquid set inside an extremely roughly carved rock that appeared more like a freshly eroded boulder than a handcrafted object. “I need to know what that enchantress is doing Madelia, She’s been far too active over the past few weeks and I want to know why.” he demanded. “You,” he screamed, flying at Madelia and pinning her against the wall, “will call nothing less than My Lord, don’t forget how you came to be here in the first place.” He whispered gently into her ear, her expression unafraid. “Yes, my Lord, I will take some troops and observe her.” And dusting herself off, she stalked out of the room. “If she is attempting to fulfil the prophesy I must stop her at all costs.” he hissed, in the cavernous bowl before him a hazy image of Elera appeared and a snarl of disgust and hatred grew and spread across his twisted face, his thick black, greasy hair cascading over his shoulders, almost disturbing the surface of the strange liquid. Meanwhile Elera, Ringmore and Haylie were racing across the empty plains; the plains were big flat areas of grassy land inhabited only by wolves and druids. “We’ll stop here for the night” panted Elera they had come to a small ridge behind which they would be warm and sheltered. They hurried about unwrapping tent poles and what seemed like miles of tough stained cotton canvas, until Elera finally surrendered and, holding her articulating hands before her began to chant; the scattered poles and ropes began to dance and twirl above the wild grass, placing themselves one by one into the desired location until finally the ungainly square of cloth draped itself gracefully atop the poles completing their accommodation. "Could you do that every night Elera?" Haylie squeaked clearing her throat. The others laughed and turned in for a long night, the sky above veiled by thick dreary clouds. The sun rose lazily over the plains and everything was wrapped in a haze of yellow light, the clouds of the previous night had fallen and now hung around shrouding everything in mist. Haylie skipped down to a small spring that she had found not far from their camp to fill up her water container. As she looked up and turned back towards the tents she saw what looked like another large grey cloud creeping over the grass flats, as it grew nearer and nearer she could hear the faint sound of shouting on the wind then a large flash of red lightning stretched across the sky and filled the droplets around her. Haylie ran back to their camp as fast as she could, where Elera and Ringmore were just finishing their rationed breakfast. “Merdock’s soldiers” Haylie bent double as she attempted to regain her energy. Elera’s eyes widened, she began packing up their gear and urged the others to pack as well. Once they had finished they mounted their horses and continued hastily on their route. “We can take a short cut through the Kruezeck Mountains I have a friend who lives in one of the villages. I just hope she still does.” As they rode across the plains the sky began to fill with ever darker and foreboding clouds that seemed to form a blanket over the sky and not long after they had appeared they started to empty out onto the travelling trio, sending buckets of rain cascading down upon them drenching them in only a matter of moments. They began to slip in the leather saddles, their horses hooves skidded through mud smeared grass and waterlogged earth. Fortunately, they reached the foot of the first mountain in the Kruezeck Mountain range in no time at all thanks to their four legged friends, and found a small cave that stretched back for at least half a mile into the mountain where they set up camp and rang themselves dry and settled themselves around a fire and waited until the rain stopped. Once the rain had cleared they could see a narrow rocky path through the mist, up into the clouds that would lead them to the first of the Kruezeck villages. Leading each of their horses behind them so as to avoid loading too much weight onto the paths, they had managed almost a third of the backbreaking climb up the slate path of the mountain before a thick layer of fog descended over the peak, making the path almost invisible at times and the slates that had been firm and jagged, were now wet and slippery and shifted underfoot. Consequently, they had to be even more cautious on the perilous path below them to avoid the steep, sharp slope beside them, suddenly Elera and Ringmore heard a thunderous crash and turned just in time to see Haylie vanish in a blur of rock and limbs over the edge of the path leaving her horse fretting over the disappearance of her rider; she had slipped on the wet slates and lost her footing and was now tumbling down the rough slope of the mountain. Screaming and grasping for anything to halt her descent, Haylie’s slippery ride finally came to an end when she reached a lower section of path that the fog had not managed to reach so it was dry and firm. For a moment she just sat in her crumpled mess, coming to terms with what had just happened and then-slowly, she moved her bruised and battered limbs closer to the edge of the cliff face and began to heave herself up onto her aching legs. Ringmore and Elera were already cascading back down the path to catch up with Haylie and to make sure if she was alright, they shrouded her with words of comfort and reassurance but she assured them that she was alright and was sure she would experience worse during her time in Lardinia; they agreed to camp on a small ledge for the night, for they had been travelling for many hours and the skies were growing dark and they didn’t much fancy another incident like Haylie’s and in the dark the results could be much more severe. Dawn broke over the mountains and the early sunlight caused the mists to glow with a magical quality, after recovering from shock of having woken up, bleary eyed on the side of a mountain, Elera, Haylie and Ringmore set off one again for the Kruezeck villages; by the time they reached the first village their supplies were running low so each of them was hoping for a nice warm inn bed and a hearty dinner and breakfast. Once they reached the first village named Fetrovast which in elfish simply means first, Elera ambled up to a fawn at the top of the street and asked him if he might know of a woman named Killga Maroona. “Yes I do know of her, but she lives in the next village, the big house at the top of the street” was the fawns answer. When Elera rejoined the others she pointed to a rope and log bridge that spanned the distance of the two mountains and that led to the second village Semorvast which means second. Haylie looked questioningly at the rickety bridge before her and almost refused to set food on the treacherous looking excuse for a bridge, Elera however was perfectly confident in the bridges' creator's workmanship and insisted that it was perfectly safe for them to cross. Naturally they crossed with ease, but Haylie insisted that she would not relinquish her grip on the rope handrail until she reached firm ground on the other side. In addition to Haylie's complaints the horses were no more pleased to learn of their path foreword, though they seemed to cross with less fuss than Haylie the others could tell that they were distressed none the less. When they reached the second town everything seemed deserted, no one was walking about the streets, the shop windows were smashed and peoples belongings lay strewn along the ground. “Look I found something” cried Ringmore; there was a single line of footprints leading through the town and down the other side of the mountain and a pair of curved axes crossed over each other like an x. “It’s the mark of the Morgantian army’s latest strike, they always travel single file to hide their numbers so their victims are unprepared" Elera explained. Out of her shoulder bag Elera pulled a scroll of parchment and when she rolled it out Haylie recognised some of the names on the paper before her such as: Higbridge, Kruezeck Mountains and The Plains. 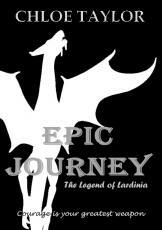 Once it was straightened out she saw that it was a map of Lardinia. The detailed drawings looked almost three dimensional, as if it were a holographic map from a futuristic movie of some kind. Then Elera pointed at a ruined tower appropriately labelled the Old Watch Tower. “But what do we do about Dracon? If we get too close he’ll roast us alive.” Haylie reminded the others. “Well we’ll have to think about that on the way” Elera said spreading a fake smile on her face trying to cover her worried expression. Ya! It's nice to read, its not crazy complicated, and its FUN. My suggestion for editing? Read it out loud. This will make a lot of mistakes REALLY apparant (I'm getting ready to do it to my own work), and will be a good check if you have got your 'feel' right. Also, have you read the Runelords, by David Farland? Your syntax and pacing reminds me of his work. Thanks for your comments I'll deffinately try out some of your correction methods, i've already started to go back throuh my work. Haven't heard of David Farland, might look him up! Thanks again. Another great chap, it was fun and easy to read and now I can't wait to read more... so bye Im going to read the next chap. Haha thanks Moonlight Syndicate, I'm glad you're enjoying it so much!! This page was created in 0.4177 seconds.